I am super thrilled with this project especially for the total investment of only $10 and 10 minutes of my time. Seriously! The best bang for my buck that I’ve had in a while! 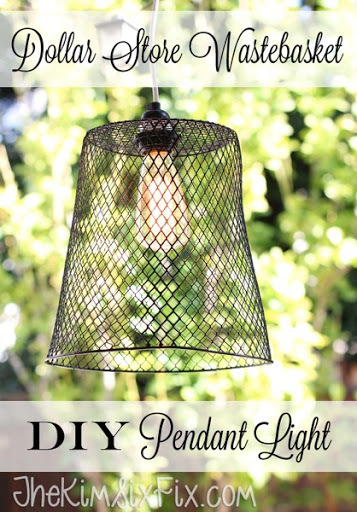 This fun pendant light came about when I was searching the dollar store with the kids for items to use for their school valentine’s this year (we ended up settling on this and this) but I also happened upon these great little metal wire trash baskets and I knew immediately what I wanted to do with them! Turn them into pendant lights! I actually had all the supplies on hand, but if you wanted to make your own it is pretty simple. You need the basket, a light cord kit (I used this IKEA one since it has a screw top attachment that secures the basket to the socket) and an Edison bulb. I love the ‘farmhouse’ feel of it. I actually have it hanging off my pergola in the backyard right now, and I am thinking of making a couple more, to give us a little extra light when we eat outside now that it is finally warm enough to do so. Now add your bulb (I used the edison style since they are so darn rustic!) and that is it! After I made mine, I saw this version at Antique Farm House (for $30! Yowza!) and I am considering cutting the basket down and making it shorter.. to look more like this one. What do you think? Should I try the shorter look? Even with it a little longer I still think it is pretty cool. Especially for 1/3 of the price!